Meanwhile there’s a conservative yet savvy grandma in the Midwest raking in more monthly income than my boy, on a modest $387,000 in savings. What’s her secret? We’ll get to that in a minute. First, let’s lament my man’s millionaire curse. His stash of cash does him no good, other than giving him something to worry about. His million-dollar problem? He doesn’t know how to turn his green pile into a steady, sustainable income stream. And since he believes in efficient markets, he has no interest in exploring investments that could pay him 7% or 8% annually – providing him with $75,000+ in yearly income while leaving his capital intact (or better than intact) to boot. The “efficient” S&P 500 pays a pathetic 1.9% – practically a 150-year low. And the 10-Year Treasury yields about 2.8%. Any friend of yours who piles a million bucks into either is only generating $19,000 to $28,000 per year in income. That’s less than your neighborhood barista. And heck, unless your friend is a multi-millionaire already, they’d better go get a job at the coffee shop! On a monthly basis, these “one millionaires” aren’t even clearing $2,000 per month. And if they saved two million, they still only have $4,000 in monthly income. If only my broke millionaire friend knew about these three monthly dividend stocks. Would you please forward this article to him after you read it? If the name sounds familiar, that’s because Gladstone Commercial is part of a family of public investment vehicles that includes Gladstone Investment Corporation (GAIN), Gladstone Capital Corporation (GLAD) and Gladstone Land Corporation (LAND). This particular Gladstone is a fairly diversified single- and anchored multi-tenant REIT that deals in office and industrial space, as well as some medical properties. It also buys up land in a few ways: traditional acquisitions, build-to-suit and sale leaseback transactions. 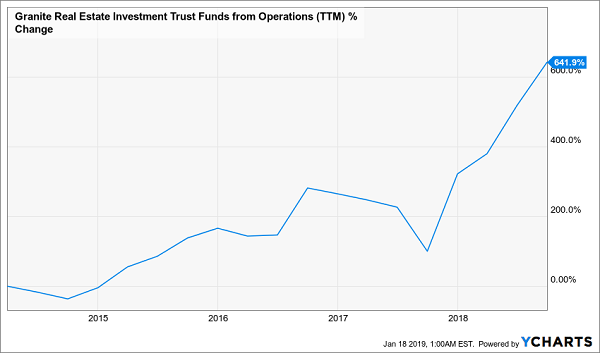 This REIT has been a growth dynamo for several years, tripling its funds from operations (FFO) since 2011 on revenues that have steadily climbed by 150% over that time. For the most recent quarter, Gladstone Commercial reported a 5% improvement in FFO to 40 cents per share on a 9% boost in revenues. I’m also encouraged by their “capital recycling” program, in which it’s shedding non-core properties to both de-lever the portfolio and snap up properties more in line with their target markets. Just note that the dividend, while generous, isn’t growing. FFO is enough to tackle dividends with just a little room to spare, at a roughly 94% payout ratio. Still, Gladstone offers plenty of total-return potential as it keeps growing like a weed. Sitting around and collecting monthly dividend checks is nice, but the best plays are going to have a growth component. That’s what makes senior-living REIT LTC Properties (LTC) an ideal position – it’s a play on the unstoppable mega-trend of the aging baby boomers. LTC invests in and finances senior-living centers, boasting a portfolio of 205 properties – split into 103 assisted-living centers, 95 skilled-nursing properties and 7 “others” – across 28 states. It also focuses on long-term property leases that typically span 10 to 15 years, which has a stabilizing effect on cash flow. Better still, roughly three-quarters of the company’s leases and loans won’t mature until after 2024. 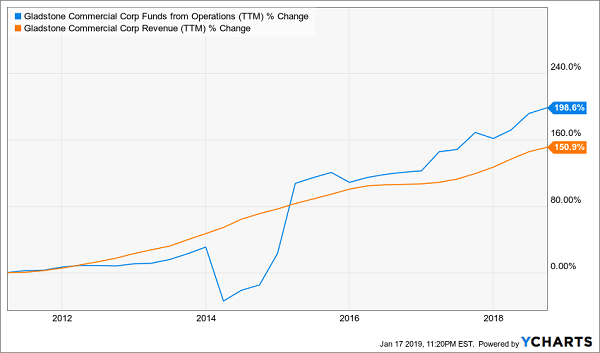 LTC suffered a small setback in 2018, with FFO sliding slightly from the previous year. But all the while, the REIT increasingly is looking like a bargain. The company yields more than 5% (well more than double the S&P 500 average payout), on a very stable dividend that makes up just 76% of FFO. And the price is right: shares have dipped below 15.0 times FFO. Canadian real estate play Granite REIT (GRP.U) offers a rarity in the world of monthly dividend stocks: a rising payout. This industrial REIT owns approximately 30 million square feet across 92 properties – covering warehouses, logistics real estate, multi- and special-purpose – across the U.S., Canada and seven European countries. It has a wide base of blue-chip tenants, too, including Samsung, Siemens (SI), Mercedes-Benz, Cardinal Health (CAH) and Magna International (MGA). The company is actively looking to decrease its concentration in the latter tenant while growing out its modern distribution and e-commerce assets. Like Gladstone, Granite REIT is shedding a few properties, which is dragging down near-term FFO but positioning the company to chase strategic growth opportunities this year. It pointed out in its most recent investor presentation that global e-commerce sales are expected to more than double by 2021, and that all that e-commerce expansion requires a lot more distribution space. Unlike Gladstone, Granite REIT has actually turned up the volume on its dividend for several consecutive years, including last year when it bumped its payout from 22.7 cents monthly to 23.3 cents. There isn’t a ton of room for substantial growth, but an FFO payout ratio of about 85% means the company can continue providing at least token increases as long as Gladstone can squeeze a little extra growth out each year. Even if you’re not trying to get really rich, I’m sure you want your money to last forever. And that’s exactly what this savvy grandmother is doing as she out-earns many millionaires, including my poor rich friend. You can easily follow in grandma’s footsteps and collect 7%+ annual yields while watching your portfolio actually grow in value as well by following this 2-step formula. 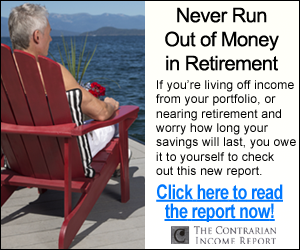 The average buy in our Contrarian Income Report portfolio pays 7.5% today. That’s $75,000 you can spend every year, without touching your million. Or $37,500 per $500,000 nest egg, with the egg untouched. You get the idea. Plus, like grandma, we have some upside on our capital as well. Want access to my best buys today? I’d love to share my full analysis, including names, tickers and buy prices. 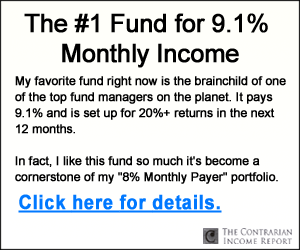 Click here to access my favorite No Withdrawal Portfolio plays right now.